These quests cover several days, but I am putting them all together on one post. Heya Rita! I was surfing J-Bay the other day and made a great deal. A real treasure map! Well… at least one out of the four pieces of one. If I could only get a hold of the other three parts then I could find the treasure. I’m sure it is amazing! There were two parts up for sale but I only managed to buy one of them. Someone called “Butler_o1” bought the other one… the only thing I know about him is that he also lives on Jorvik. If you help me find the other parts of the map I’ll split the treasure with you. What do you say? If you are up for it you should start with figuring out who “Butler_01” is and try to get his part of the map. Objectives: Find the person who calls themself “Butler_01” on the internet. They live somewhere on Jorvik. The name must be a clue as to who they really are. The only butler we know is Godfrey. Let’s go talk to him about this. Uh, “Butler_01”? Yes, that is me. How did you know? I see Rita, you can absolutely have part of the map but then I want my share of the treasure. We have plans to scan in all the books in the library to make them available for everyone in the world to enjoy. Unfortunately we haven’t had the money to get it done… so this treasure would really give us exactly what we need. Take my piece of the map and ride over to James. Let him know that I want to share of the treasure as part of the deal. Objectives: Ride back to James and tell him what the Butler said. Oh come on Rita… did you promise to give away a share of the treasure to the butler? Don’t you know how to negotiate? This is how it is done. You made the deal with the butler so you can split your share with him! James is getting a little greedy now. These quests really make me not like him…. I’ve been surfing on Jorvikipedia while you were gone Rita. The map belonged to the famous American treasure hunter Mississippi Jones. He died a long time ago, but he was an adventurer who came to Jorvik a generation ago. His heirs couldn’t decide on how to split the treasure so they tore the map in four pieces and kept one piece each. I was lucky to find a lead on his daughter, California Jones. Her grave is somewhere nearby, but I’m not sure exactly where… it only says she was buried with a view of Fort Pinta… the town she loved so much. Objectives: Find the grave of California Jones. It should be somewhere with a great view of Fort Pinta. The only graveyard close to Fort Pinta is in Doyle’s Abbey, though it isn’t much of a view for all the bushes. The grave is in the northeastern corner of the Abbey. Where Did the Bouquet of Flowers Come From? Objectives: Someone has placed a bouquet of dandelions on the grave, find the person who put it there. Mrs Holdsworth is the master of dandelions and fixing sick cows. Go speak with her in Moorland. Heya Rita! Those are some nice dandelions! Yes, California Jones was my grandmother. She loved dandelions so I put a bouquet of them on her grave every year. An old part of a map? I think I might have it in a box somewhere. Here is my part of the map. Make sure James knows about the deal! Objectives: Ride back to James and tell him what Mrs Holdsworth said. Tell James about the deal and the next piece of the map, though he won’t be happy about it. What are you thinking Rita? Now Mrs Holdsworth is in on the treasure too? That is also coming out of your share! If you keep doing this there won’t be anything left for you at all! I’ve been doing a bit more research on Jorvikipedia and trying to find out more about the last piece of the map. I’m pretty sure it is in Silverglade Village. Mississippi’s son Washington left everything he had to the people of Jorvik. All his possessions were taken care of by the council in Silverglade. Objectives: Speak with the Councilman in Silverglade Village and ask about the will of Washington Jones. The Councilman is near town hall in the center of town. Speak to him about the last part of the map. Ah yes… Washington Jones left everything he had to us. An old piece of a map? That must be stored in the archives. The archives aren’t in Silverglade Village anymore. Which ironically is mostly because of Washington Jones. He was an avid collector of just about everything. When we went to archive his collection it filled up the entire basement of the city hall. 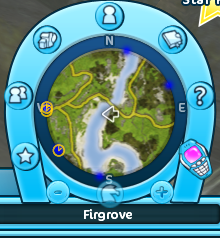 It really wasn’t practical in the long run so everything was moved to Firgrove. Ride over there and ask my colleague there, I’m sure he will know all about it. Objectives: Speak with the Councilman in Firgrove about the collection of Washington Jones. Ride to Firgrove, and speak with Mr Franklin. He can be found at the town hall across from the stables. Good day Rita. Washington Jones collection? Yes it was stored here. But it isn’t here anymore. Washington Jones collection was so big we were forced to hire out a place in an old mine around here. There was a lot of unused space in that old mine. It is shut down now and there was a big spring so unfortunately I’m not sure what has happened to the collection. If you are lucky the old piece of the map might still be there. You should ride over there and have a look. Good luck! 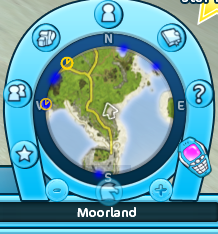 Objectives: Find the piece of the map by the old mine outside Firgrove and ride back to the Councilman in Firgrove. Funny how no one is really concerned precious artifacts could possibly have been destroyed in the flood. The mine is highlighted in orange on your map, so it should be easy to find. It is down behind the sandpit, and can be seen from the road. Go to the mine and look for a bunch of wooden boxes laying on the ground. Search all of them, then return to Mr Franklin. Look at that. 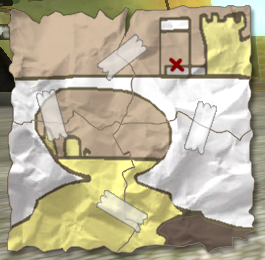 There we have the old piece of the map. That piece of the map belongs to all the people of Jorvik so I can’t just give it to you. If you want this piece then you will have to share the treasure with the people of Jorvik. We need every shilling we can get to build new roads and new stalls. Objectives: Ride back to James and tell him what has happened. Speak with James in Fort Pinta. Mr Greedypants surely won’t be happy though. Now I’ve put together the map but I still don’t understand it… Here is the map Rita, you can give finding the treasure a try. 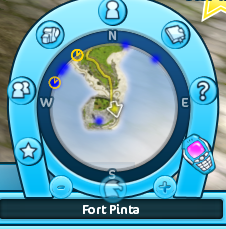 I need to take care of my customers that are here and want to spend money in Fort Pinta. I don’t have more time for looking for treasure now. Come back when you have found the treasure. Objectives: Follow the map to Mississippi Jones’ treasure. And this lazy bum wants HALF the treasure. Yet he hasn’t done squat! The map shows the profile view of the Fort Pinta bridge, with the X marking right next to the wall. Ride towards the bridge, and you’ll see the clue across from the stable. “HA! Did you really think it would be that easy? If you want the treasure of Mississippi Jones you are going to have to work for it! It isn’t easy, but I can’t have just any idiot finding my treasure. The map is only the first clue. If you want to find the next clue you will need to make your way to Doyle’s Chapel. Ride there but don’t leave the path a bird would take between here and there. Objectives: Follow the clue’s directions. The clue references the saying “as the crow flies” which means to travel in a straight line. You don’t need to go to Doyle’s Chapel. The next clue is along that line towards the chapel though. The next clue can be found on a little stone in the sand, off the road, between Fort Pinta and Doyle’s Chapel. “You have passed my first test. But now it will only get harder. “Follow the beach towards the river. By the smallest pillar where the river comes out you will find the next clue. The next clue is found on the smallest stone pillar on Thorny Banks. “Follow the running water and look for a way across. Right there by the water’s edge you will find the next clue. The next clue is by the southern bridge crossing the Silversong River. You’ll have to go back up on the road to get to it as you cannot follow the beach all the way there. The next clue is on the east edge of the river, down on the south side of the bridge. It is a little log sticking out of the sand. “Now it is beginning to get exciting! You haven’t given up have you? “Stand in the center of the bridge and look at the castle. Ride in that direction and before you are half way there you will find the next clue. 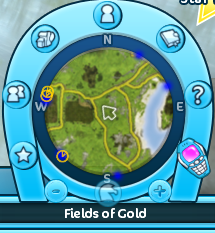 The next clue is a couple of rocks, halfway up the hill, in the Fields of Gold. “You are getting closer… but there is a way to go yet. “Go up the nearest road and ride back to the place where you began the hunt. Where three roads meet you will find the next clue. 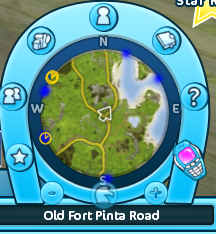 If you ride the U shaped road back towards Fort Pinta you’ll find the next clue at the intersection. It is on the corner of the stone fence. “Next to you is a high cliff. Ride up on it and look around for the next clue. The next clue is at the top of the cliff, across from Doyle’s Chapel. You’ll have to ride a bit to the south to get to the base of it. The clue is a flower pot at the very top. “The final clue is coming up. Don’t give up. “You are now almost there. Look again towards the castle. In front of it you see the druids’ monument. At the foot of the monument you will find the next test. 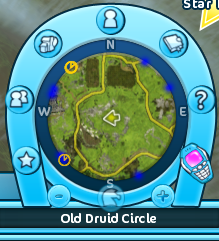 The old druid circle is up on the hill between where you are and the castle. Go to the large stone in the middle for the next quest. Objectives: Ride over and speak with Elizabeth. Your treasure hunt is only partway done. Ask Elizabeth for help with the runes. The old runestone? Yes I know that one. But what the runes mean I’ve never really thought about. I’ll go over there later and have a look. Why don’t you come back tomorrow and I’ll tell you what they mean. Now I’ve been to look at the runestone you asked me about. Fascinating really Rita. The runes tell the story of an ancient ritual that will open the mountain… whatever that means. Mississippi Jones must have figured out the ritual and hidden his treasure there. The good news is we druids learn that ritual in pre-school so I know exactly how to open it. To open the mountain you’ll need to collect four different stones. They will be used in the ritual later. But first we need to find the stones. The first stone is red volcanic rock and you’ll find it in the mountain at the end of Everwind Fields. You need to find a way deep into the mountain to get that stone. I’m not sure how but I am sure you will figure out a way to do it. Maybe you can ask someone there to help you? Objectives: Ride to the north part of Everwind Fields, once you are there try to find a way in to the heart of the mountain to get some red volcanic rock. Maybe you can ask someone there to help you. The Crew Lead on the construction site will know how to help you. Speak with him. Red volcanic rock? I have millions of red volcanic rocks, take your pick. When we blasted out the tunnel we filled truck after truck with them. They are behind the big cliff there. Objectives: Choose a red volcanic rock and ride back to Elizabeth. To get to the rocks, go out of the construction site, and go past the hill that Mr Bucket was standing on, where one tower of the gondola lift is anchored. Go around the other side of this hill and head back in the direction of the construction site. The red rocks are on the ground. Take one of them and return to Elizabeth in Valedale. Good Rita, that volcanic rock will be perfect. The next rock you need to find is a kind of Earth Stone. You can usually find this kind of stone in freshly dug ground. Around the Winery there should be lots of them… it shouldn’t be hard to get one. Speak with someone at the winery. Objectives: Ride over and speak with someone at the winery about where you can find an earth stone. Judy is up with all the happenings around the winery. She should know where the earth stones are. Earth Stone? We have more than we want all over the winery. The Baroness thinks they are ugly so we have cleared away all that we could find. Where can you find an earth stone? Hrmmm… We’ve thrown away all we could find. Maybe if you look at the edge of the fields around the winery. Good luck! Objectives: Look around the edge of the winery fields for an earth stone. They are scattered through most of the outer fields of the winery. The easiest one to get to is in the back of the winery. Cross the little bridge, and they are in the lower tier field. It is the same field that you check the soil instruments for Carney. Return to Elizabeth when you have found one. Have they thrown away all the earth stones? Lucky there was at least one left. Well done! The Moss Stone you need is rare but we used to be able to find them by the Silversong River beach. Look there. It might take a while but I’m sure you will find one. Objectives: Look around the Silversong River beach for a Moss Stone. I’m sure they can be found in other places along the beach, but the one I found was on the little bit of beach where the land juts into the river, south of the southern most bridge, on the Firgrove side of the river. Was it had to find a moss stone? Well done! Star Stones can be found high up in the mountains around here. It is hard to ride up there… but wait! I have an idea! Look around the rocky outcrops by the road on the way to Valedale lake. When they were building the road I’m sure they knocked down some Star Stones and they should still be there. 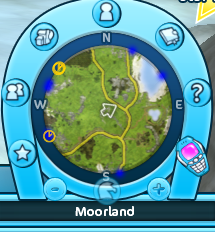 Objectives: Look along the road to Valedale lake for a Star Stone. Take the Valedale Lake road, and after the last switchback, just before you get to the top, there’s grass of to the left of the road, that you can ride on. You have to go through some bushes (take it slow so you don’t fall off the cliff, oops!) and there are some Star Stones on the ground there. Well done! I wasn’t sure you would be able to find a Star Stone. But we can always count on you Rita! Now that you have all the different stones it is time to solve the riddle of the Runestone. I’m sure you understand by now that this is a puzzle. I’ not going to explain how it is done… look at this as a test. Instead I’m going to tell you the meaning of the runes and see if you can figure it out for yourself. So, now you will be able to read what is written on the runestones. Ride over there now and good luck! Objectives: Ride over to the druid stone and solve the puzzle with the stones. Ride back to the runestone so that you can begin the puzzle. Objectives: Solve the puzzle with the druid stones. Place the stones in order from the planet’s core and outwards (volcanic, earth, moss, star), starting with the innermost stone on the pedestal closest to the central runestone. They must be placed in that exact order on the correct pedestal. If you have trouble finding which pedestal is which, click on it, and it will tell you which stone to place on it. Objectives: Ride back to James in Fort Pinta and show him the treasure. Time to show our greedy little friend what we found. Hahaha Rita! You did it! Now we can have a look. A bunch of silver coins… an ugly statue… an old moldy hat… I can trust you and you can absolutely trust me! You get the ugly statue and hat and I’ll take the silver coins. That seems more than fair, you get two things and I only get one. I know, you don’t need to say anything, I am too generous for my own good sometimes. Have a great day! See you later. Are you still here? I’ve got a bunch of important things to do right now… but maybe you should ride over to the councilman in Firgrove and share your share of the treasure with him… as we agreed before. Here, take a silver coin as a souvenir. You don’t need to thank me. Objectives: Ride over to the councilman in Firgrove and tell him about the disappointing end to the treasure hunt. Show Mr Franklin in Firgrove what you have found. So you found the treasure? Fantastic! What’s that? James took all the silver coins? Let’s see the coin you have. Hmmm… hehe. That is a ten-pence, worth about half a shilling. I doubt that James has even earned back what he paid for his piece of the map on those. But you got an amazing adventure, am I right? Wait a minute… that statue… let me have a closer look at it.Wow! You know what you have found?! An ancient statue made by the old horse tribes here on Jorvik. This is a priceless cultural artifact! This belongs to all the people of Jorvik so it needs to be displayed so everyone can see it. As an archaeological find I need to take this from you right now… but you should get your reward for finding it. I will see that the Butler and Mrs Holdsworth get their share of the reward but you definitely deserve your share. You have done Jorvik a great service Rita. Thank you! You should keep that fantastic hat. It looks great on you, I have to say.